U.S. 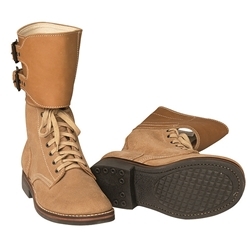 Combat Boots WWII Combat Boots - High quality reproduction boots worn by our troops in the European and Pacific Theaters. Full-grain suede leather uppers, comfortable leather footbed, sure grip rubber out soles, repairable Goodyear welt, leather ankle wrap around with dual adjustment straps. 7 eyelet lacing system and brown cotton laces. Approx. 12 ½" tall and pair weights 4 lbs 7 oz. Medium width, for half sizes order next size larger. US men's whole sizes.